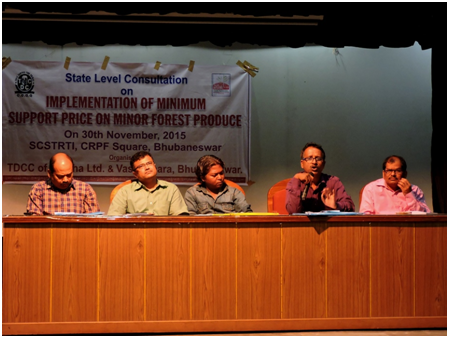 A state level workshop on the implementation of Minimum Support Price (MSP) for Minor Forest Produce (MFP) was jointly organised by Tribal Development Co-operative Corporation of Odisha Ltd (TDCCOL) and Vasundhara (NGO) on Monday at the Auditorium Hall, SCSTRTI, here. Around 100 participants like members of the Primary Procurement Agency (PPA),NGOs, TDCCOL and ORMAS joined the workshop. Mr.Y Giri Rao, Director of Vasundhara welcomed the participants of the workshop. Sharing the objective of the workshop, he said, “MSP for MFP” is a historic step of Ministry of Tribal Affairs, Govt. of India to give benefit to the lakhs of forest dwellers depending upon forest produces for their livelihood and this scheme is being implemented in the State of Odisha from last July 2014.” “Thus it is pertinent to review the achievement and failure of this scheme after the completion of one year of its implementation in the State” he said. SubrataKar, General Manager of TDCCOL presented a detailed status report on the implementation of MSP scheme during the 2014-15session in the State. He shared that under the scheme, the State level Monitoring & Coordination Committee has been constituted. Besides, District Level Monitoring & coordination Committees have been constituted in 23 districts. “In the last season MSP scheme could been implemented only in 13 districts and in total only 580 Primary Procurement Agency (PPA) could approved from 1098 G.Ps and 136 Blocks in the State. Out of the 10 MFP included in the scheme, procurement has been done only in case of six MFPsin the State and due to the reservation of Forest Department, Govt. of Odisha, the procurement of three products i.e. Gum Karaya, Sal Seed and Lac has been stalled.” He said. While the approved quantity of MFP collection was 1,31,000 quintals, with the help of PPAs , the TDCCOL could procured only 4381.7 quintals(Harida-232.94 , Seeded Tamarind-3030, Char Seed-105.28, Karanja Seed-160.76, Sal Seed -232.39 and Mahua Seed-623.23) in 2014-15. The total operational cost incurred was Rs.1,34,67,045.00 including the MFP procurement cost of Rs.99,09,049.00 rupees during the session. Mr.ChitaranjanPani of Vasundhara shared the important issues in the implementation of MSP scheme in the State.The important issues he shared are; lack of awareness on the scheme at the community level; Problems in the selection of Primary Procurement Agency(PPA); Lack of proper coordination among the different line departments at the district level;Poor progress of Infrastructural Development & Modernization of Haats though money has been allocated;PPAs facing hassles from TDCCOL officials on FAQ; Deduction of price due to FAQ; Transportations, maintenance of procurement registers; Illegal restriction of Forest Department for the implementation of MSP scheme in Protected Areas tillMoTA’s clarification on 10th April, 2015.Besides, the STSC Department took long time to notify TDCCOL and OFDC as State Procurement Agency. Four to five PPAs participated in the workshop shared their experiences in the procurement of MFP under the MSP scheme. The important problems shared by PPAs are weigh loss due to lifting of procured MFP after one month by the TDCCOL despite of prescribed 7 to 10 days under the MSP scheme, storage problems, late payment, purchase of gunny (bags) etc. PPA presentation was followed by open house discussion. All the members present in the workshop emphasised on the wider publicity of the MSP programme at the ground level and selection of more and more number of PPA at the village level. ManoharChauhan, member Campaign for Survival and Dignity(CSD) criticised the State Forest Department for its anti-community attitude and creating obstacle on the way of implementation of the historic MSP scheme in the State and keeping control over Kendu leave and Bamboo under its control despite ownership rights ensured under FRA,2006. He suggested the TDCCOL to seek financial support from the nodal STSC Department, GoO and MoTA from Article 275 (1) of the Constitution for the wider publicity on the MSP scheme at the grassroots by involving CBOs and NGOs. Among others who addressed the workshop are Ashok Mishra, Regional Manager, TRIFED, AmiyaTripathy form OFSDP etc. The workshop was moderated by PratapKishorMohantyof Vasundhara. At the end of the programme Vivekanand Patnaik proposed vote of thanks to all the participants of the workshop.